November 13th marked the day when Google unveiled its new line of Nexus devices running on the most anticipated Android 4.2 software, ‘Jelly Bean”. The very same day Microsoft brought to Pakistan, its new OS Windows 8. Since then the next-gen Operating System has started a buzz all around the country. Windows 8 is the predecessor to Microsoft’s most’ successful OS to-date, Windows 7 and is built on the its platform. It not only caters to the traditional desktop computers but also touch enabled hand held devices, such as the new range of Ultrabooks, Slates, Tablets, All-In-Ones and Convertibles to name a few. Microsoft Pakistan recently held a two day event (13th and 14th) at a local hotel in Karachi. The event, hosted by Sherif Morsi, Windows Client Business Group Lead, was divided into two parts one for the developers and tech savvy personnel, and another for enterprises and small businesses. “Windows 8 is a re-imagination of a Windows concept, beginning a new era for us, with no comprise on the software – stated Mr. Morsi. Windows 8 has been rumored to come in a 128 bit version as well, but only the 32 and 64 bit versions are available to this point. The Windows OS will be available for purchase via two methods either you upgrade your original Windows 7 to Windows via download from their site for a special introductory price of $14.99 or purchase a FPP (Full Package Product) which is the whole box basically for $69.99. The special offer is only available for those users who have purchased a Windows 7 running device after June 2, and is valid till January 31. The OS comes with an innovative password method called Picture Password. A picture of your choice pops up on the screen and to unlock the device you can draw a circle,a few dots or even a straight line. Putting a password was never this fun! This is what sets apart the new Windows from the old, the Start menu has been redesigned completely in the form of colorful Tiles. The Tiles can be re-sized if you want more space on your screen, You can also put custom apps on them for quick access. If you slide your finger or take the mouse cursor on the right side of the screen then you get a new search panel called “Charm”. It is a system command bar through which you can change the system settings and also contains a search bar, with the help of which you can search your entire device or even search on the web directly from there. Searching for something was never this simple. 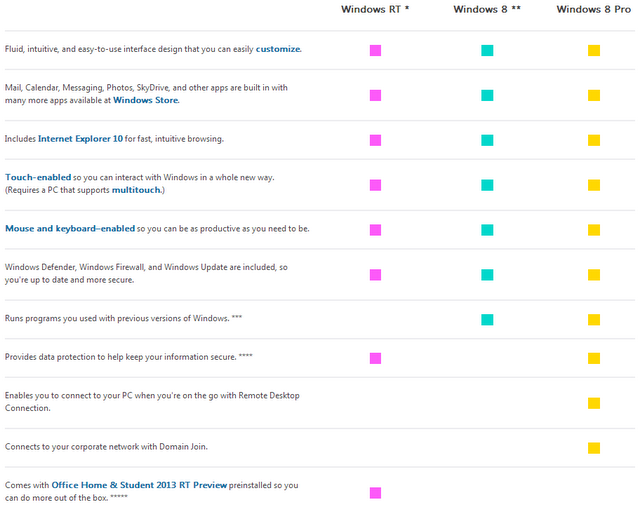 IE 10 comes pre-installed with Windows 8, the browser has been modified keeping in mind touch enabled devices. This means no annoying tool-bars or any such bar on top of the screen, so now you can view a website basically in full screen on your device. To get the drown down options menu you either scroll down from the top or just hang the mouse of the top corner. IE 10 has been integrated with the new Windows UI, this means that you can pin your favorite website in the Start menu in the form of a tile. This is the place where you get thousands of apps for your Windows device, Each user can use the same app for 5 separate Windows 8 devices with one single user account. Though the number of apps on the store do not come even close to that found on the Play Store or Apple Store. All said and done, Windows 8 has been built keeping in mind the end user and what they want in their Operating System as can be seen from their “Everything at once” promotional tag line. We all have high hopes for it but only time will tell if it will be able surpass its predecessor or not.